While the apples and pears continue to fall, their need for a storage solution is far less immediate than that of the blackberries. The farm is pretty much hedged in blackberries at the moment. Many of those blackberries are bland and a bit pippy, but there’s a few choice bushes with the best blackberries I’ve ever tasted. Every day on my post-lunch walk I can’t help but pick whatever blackberries have ripened since the day before: this is a lot of blackberries. 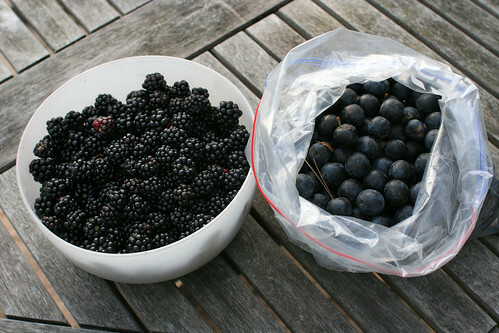 Blackberries don’t keep very long off the bush, so I tend to freeze most of the ones I pick straight away. But with the freezer filling fast, it was time to take action. The solution did not solve my freezer space issue, but it did result in something delicious. David Lebovitz, my source of inspiration for all things ice cream, has a recipe in his excellent book The Perfect Scoop for Banana and Blackberry Sorbet. I decided to make this with a little autumnal twist by adding sloe gin. The upshot: alcohol helps keep the sorbet from going rock solid in the freezer, making it more scoopable and hopefully giving it a nice subtle undertone of sloe gin. 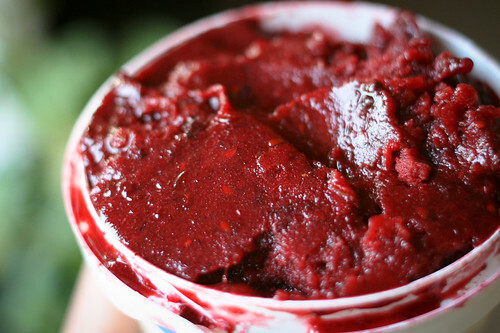 I subbed some of the sugar for some blackberry plum jam I made a few weeks ago and added three tablespoons of sloe gin to the original recipe (the maximum amount of alcohol David recommends to keep the sorbet scoopable without being slushy). Adapted from The Perfect Scoop by David Lebovitz. David’s original recipe called for 1/2 cup of sugar; I did 2 Tbsp plus 1 Tbsp of blackberry plum jam. I suspect my version is much less sweet than his, but I wanted something with a bit of tartness, not too sweet to overpower the fragrant sloe gin. To me, this is the perfect after-dinner palate cleanser. It packs a lot of flavour; a small cup is all you need. 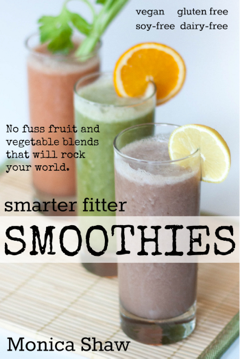 Put all of the ingredients in a blender and blend until smooth. Taste the mixture and, bearing in mind that the frozen version will taste less sweet, add more sugar if you’d like. This sounds inspired, truly. I wish I could taste it! Your thinking is spot on, with liquor involved. What an absolutely refreshing way to end a meal…. I think what would be even more inspired would be a plum and sloe gin sorbet or ice cream. Sloes are from the same species and so their flavour is a very nice compliment to plums. That said, I think they complicate blackberries just as well. If anything, I might of liked a bit more sloe flavour to come through, or perhaps an additional spice to bring everything together. I had a plum granite at Wild Garlic Restaurant recently that was to die for – plums with juniper berry and cinnamon. I actually mentioned that the flavour reminded me of sloe gin, then was reminded that gin comes from juniper berries. Hmmm… Perhaps something to experiment with next time. Beautiful sorbet! I didn’t buy any blackberries this year–got a little blackberried out last year at the restaurant–but I’ll have to keep this in mind. What does the banana add to the recipe? Thanks for enlightening me!